and include background music or narration? 1. The program we will be using is "Windows Movie Maker" and it is probably already on your Windows computer. 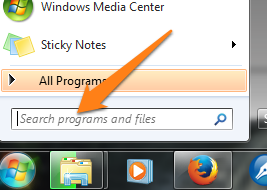 To find it, use the search box in the bottom, left corner of your computer. 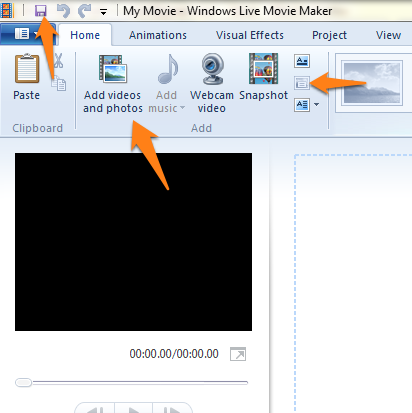 Click on the round Windows icon, then type in "﻿movie maker﻿". 2. 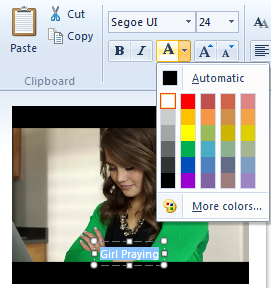 Windows Movie Maker is a feature-rich program considering that it is free. We will only cover a few portions of what it can do. First we need to know the difference between saving a "project" and saving a "movie". The project is what you edit to create the movie. It uses your pictures and your sound files. 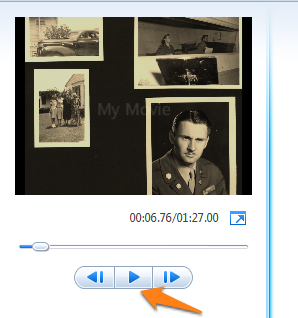 When you are finished, you use "save movie", which makes a video file that you can share with others. 3. To know what a tool does, just hover your mouse over it. a) save (the purple square in the very top corner) which saves the project. 4. 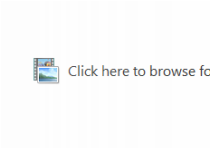 Click in the middle of the screen for the option "add videos or photos". Find the photos you want to add, place them in the order you like. 5. You can move photos by clicking and dragging. 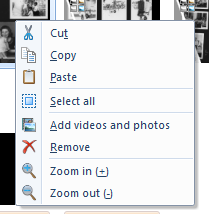 Also, you can right click on the photos for additional options such as "remove". 6. On the left are controls to watch the movie. Click the triangle for a preview of what the movie will look like. 7. 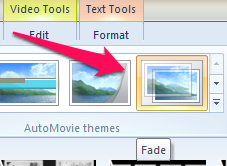 Hover over some of the "AutoMovie themes" to see what your slideshow will look like if you choose it. I recommend the last them on the right "Fade", as seen in this image on the left. This will add a title at the beginning, some credit slides on the end, and it will provide a transition effect between slides called "Fade"; so as one image slow fades out, the next image will slowly fade into view. Optional: Add your own transitions in the "Animations" tab. Hover over an option for a preview. 8. Now you are ready to add add captions to each of the slides. If you get lost, click the Home tab. The color of the caption can be changed as needed. 9. After that, we can either add background music or create your own narration. To record your own voice, you will need a microphone, which can be plugged in near the speakers. 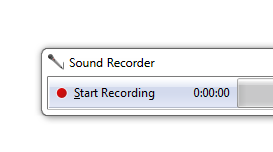 Search for "Sound Recorder" in the Search box like before. 10. Record the narration as you preview the slides (See #6). Save the recording to your computer. If you want to edit out only a portion of an audio clip, a free program to do this is Audacity. 11. 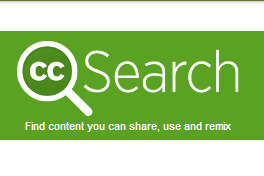 Alternatively, you may want to search for music at search.creativecommons.org which offers non-copyrighted material. Enter your search information, then click on one of the buttons for a search. Another popular search tool for shared images is commons.wikimedia.org. LDS.org allows you to use LDS images for non-commercial, home use. If you find music from wikimedia.org, you will need to convert it to MP3 format. Perhaps the easiest way is to use Freemake Video Converter at Freemake.com. Another popular option is WinFF.org. 12. Add music or sound with the button in the top, left corner. Then you can save the movie by clicking the button in the top, right corner. 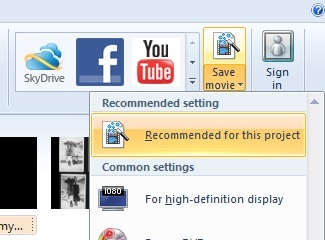 Personally, I prefer the option "Recommended for this project" when saving. It has a better picture quality than some of the other options like "for DVD" and "for computer". 13. Be sure to save your project, too for continued use later. This is in the File menu or click on the purple square (See #3). You can't use the project on other computers, but you can share the movie.